As requested, here's Chatty Cathy's (aka, Bill Loguidice's) casual, single take look at the official TRS-80 versions of Frogger and Zaxxon, shown on a 128K TRS-80 Model 4 with a black and white monitor. Of course I talked too long yet again, so yet again it won't fit on Youtube. I also need to get new video software to work with the HD MOV files, so this is raw footage and another reason why I can't knock it down to a Youtube-friendly 10 minutes (I'm experimenting with Adobe Premiere Elements trial in the background right now to see if that's something I should pick up, since that supports the formats my video camera uses). How come I only get to see the first 5 minutes of it? As I said great video - but the cliff hanger is unbearable. How come I only get to see the first 5 minutes of it? .....Ah you need a specialized video player plug-in for it to work and be able to see the full video. Which is a shame really... Youtube videos are available for all - regardless of membership. VeoH needs a membership to access the entire movie. Ok, install the player software. The copyright monster / regional access control rears its ugly head yet again. So there is no way for me to comment on the second part of the video - a major non-US viewer - cliffhanger here. It appears that despite being available world wide in the past VeoH has become very US-Centric and started to discriminate non-US viewers. 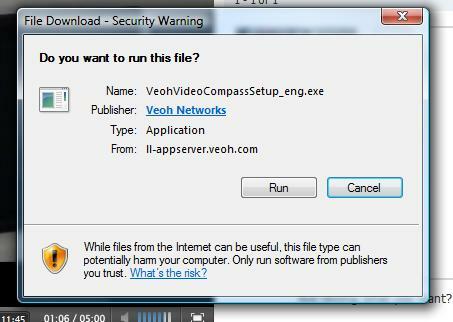 In late May 2008, Veoh discontinued service in a lot of countries. The company stated that the decision was made in order to focus on the more than 33 markets in which it has the most viewers - say whaaat? Without prior notice, users from these countries were denied the ability to backup the contents they have contributed to the website. As of June 2008, visitors (IP addresses) in the vast majority of countries, including Asia, portions of Europe, Africa, Central America, and South America, have reported being blocked or experiencing a similar message for their region. According to Wikipedia, users report being blocked from Lebanon, the United Arab Emirates, Malaysia, Indonesia, Chile, Argentina, St. Kitts and Nevis, Guatemala, Luxembourg, Costa Rica, the Dominican Republic, Venezuela, Brazil, Puerto Rico, Guam, Jamaica, Barbados, El Salvador, Hungary, Malta, Macedonia, Slovenia, Slovakia, Ukraine, Colombia, Cyprus, Romania, the Cayman Islands, Guadeloupe, Saudi Arabia, Peru, Panama, Czech Republic, Turkey, Croatia, Lithuania, Jordan, Egypt, Bulgaria, Serbia, Iceland, Bermuda, Thailand, Brunei, Honduras, the Bahamas, Nicaragua, Anguilla and Guyana. Well the Netherlands are not listed but accessing video from my home is not possible. For NON-US readers I would not recommend installing VeoH on your systems as it will only hog resources and you will NOT get anything out of it apart from 404-errors stating that the selected video is unavailable! Bill can't you edit out some of the pauses and transitions? Then you'll be able to get it down to 10 minutes and post in on Youtube or some other freely accessible webmovie host and have it available for all to see. There is no other site that I saw that can accommodate either the content (Vimeo) or the greater than 10 minute length (Youtube). Like I said, I can't edit it since my present video editing software doesn't let me edit MOV files. I suppose I could try to edit it on one of my Mac Minis in the meantime in iMovie, but I really didn't want to go all that trouble outside of my primary system, which is a Vista Tablet PC. I think I'll order Adobe Premiere Elements as my experiment with the trial version seemed to have been successful (though rendering is painfully slow). I also need an external hard drive for my laptop (assuming one of the ones I have is insufficient), as I'm just about out of space and obviously video processing is space intensive. And yes, you're 100% right. Even with light editing I could have gotten it down to 10 minutes or less. I also think I want more light in the room as well, as the HD camera I have (it's a low end one) is not good without lots of light. Certainly Youtube is the target every time. The video played just fine for me. I'm in Canada if that makes any difference. Each of which should solve a myriad of issues. It's so funny how for years you have a working setup and then all of a sudden one day you hit a wall when you upgrade one or more elements in a process (in this case, a camera). This made for great casual viewing during my lunch hour. The video played just fine from my end with no software installs or whatever. Believe it or not, these games are in many ways better than nearly all the games I ever played on the TRS-80. Frogger looked pretty much like what I expected, and it looked like a pretty decent adaptation, but WOW, I don't think I ever heard music, much less two-part harmony, on the TRS-80 before!!! That was surprising, and I would have been amazed at the time!! Zaxxon looked WAY better than I imagined it would! Although the graphics are obviously clunky, I was surprised that they managed to keep the smooth-scrolling 3/4 perspective! Again, this game looked like something miraculous for the TRS-80!!! I was amazed at how faithful this version of Zaxxon was! Frogger's two part harmony, and Zaxxon's amazing (for the TRS-80) graphics would have knocked my sox off back in the day. Believe it or not, this is amazing stuff for the TRS-80. Gotta go, but thanks for putting this up. It was great to see these games in action! Excellent work, Bill. Nothing beats being able to see the actual hardware. I'm wondering about that contraption to get sound out of this unit--was that something introduced by the manufacturer, or a third-party hack type of solution? Did RS endorse it in any official capacity? In many ways, doing games for underpowered machines is probably a greater challenge for a technical programmer than anything else. I've little doubt that the old days of single or very small teams working to eke something out of a beast like the TRS-80 really was the "Top Gun" school of games coding. It's good to see a lot of this school working now in mobile phone and browser gaming and so on. Sorry to hear about your problems, Mark. I guess it must be a US thing for sure, because it worked fine for me as well. I'm wondering about that contraption to get sound out of this unit--was that something introduced by the manufacturer, or a third-party hack type of solution? Did RS endorse it in any official capacity? The "contraption" has nothing to do with it. It's just a powered speaker (an amplifier) that just happens to be from Radio Shack. Any powered speaker/amplifier will do. The cable going to the amplifier is just the standard cassette cable, used to hook up a TRS-80 (and many other computers - TI-99/4a, IBM PC, etc.) to a standard cassette deck. Since there was no modification of the system, it was "endorsed" by Tandy. All of the software sold in Radio Shack stores by Tandy that supported sound would make mention of how it was done. It's quite clever really (probably the second coolest sound "hack" outside of placing an AM radio next to a computer and getting sound that way), though of course the downside is that it's very processor intensive (often times systems that supported sound output like this "hack" would pause every time a sound was played). The technique actually came out of how the TRS-80 controls cassette decks, by "clicking" sound signals (data of 0'a and 1's) through the cassette port. So instead of sending data to save to tape, this data was sent to a phantom tape drive, a la the amplifier. I'm a bit bummed about Drive :1 causing problems, as otherwise it's a delightful example of a TRS-80 Model 4, and finally gives me my coveted black and white all-in-one TRS-80 (like I programmed on in school, versus the more common green screen). The other Model 4 I have is not nearly in the same condition (though it does have two working drives). I also have two 4p's (the transportable version of the hardware), though only one works properly, a spare parts shell of a Model III, and several Model I's, which I have yet to test. I suppose at some point I'll have to open up the 4 again and try and troubleshoot the problem with the second disk drive. It obviously has the full 128K and may even have a processor upgrade, though I'm unsure how that would manifest itself. If I recall correctly, the TRS-80 didn't even need a "Tandy/RS" cassette drive. Any old cassette player would do, as long as it had standard connectors for phono/mic. This is unlike the Atari 8-bits (and probably others) which required a dedicated cassette "drive" to load programs. This makes the "audio amplifier" you possess for the TRS-80 seem very easily plausible in concept. And as you clearly demonstrated, it was more than plausible, it was a reality. The technique actually came out of how the TRS-80 controls cassette decks, by ]clicking" sound signals (data of 0'a and 1's) through the cassette port. So instead of sending data to save to tape, this data was sent to a phantom tape drive, a la the amplifier. I can't help but wonder if the engineers of the TRS-80 even conceived of the computer outputting sound, due to the fact that it had no speaker, and there were no obvious sound capabilities of the system. I do recall that there was a way to send "clicks" to the tape recorder's speaker via Tandy/RS Basic's "OUT" command, but only my later experiences with the TRS-80 (which was my first PC experience) had sound. My first personal computer gaming experiences were dead silent. When I first heard the first TRS-80 sound, my jaw dropped!!!!! I thought "Holy crap, the computer made a sound!!!" I can't swear it was the first, but the first time I heard digitized speech was in the TRS-80 game "Robot Attack" by Big Five Software. It was an excellent knock-off of the arcade game "Berzerk." It said "Player One," "Player Two, " and "Chicken." I thought "Holy crap, the computer spoke!!!" The awe is gone now. 3d, FPS shooters with licenced MP3 music, voiced actors, cinemas, and whatever. There's little or nothing that drops my jaw anymore, but the humble TRS-80 rocked my world. Keep in mind that while I heard simple sound effects, I NEVER heard music on the TRS-80, nor did I see such cool graphics such as Zaxxon. Those seemed so cool that I have trouble believing that they were done on the same TRS-80 platform that I experienced! Yep, like with most computers, any cassette player will do, even a PC's sound card paired with a WAV file or good quality MP3. Not a lot of systems utilized proprietary tape drives. Top of my head, Atari 8-bits and Commodore 8-bits were the two biggest proprietary offenders when it came to cassette drives (some, like the APF Imagination Machine's, were obviously built in). I doubt the Tandy engineers conceived of sound output, just like Commodore's engineers with the PET didn't. Heck, they didn't even bother with color. That's what makes the original Apple II such a progressive design--color AND sound. No matter how limited, that's what probably helped with the platform's longevity above all else, through the TRS-80 line did have a heck of a run, with Model x stuff in Radio Shack stores into at least 1990 (albeit mostly on clearance by then). Sadly, I can't recall the first time I heard speech on a computer or videogame system. I certainly have vivid memories of the speech in Impossible Mission, which I believe was the first game I bought along with my 1541 disk drive (it was between IM and Bruce Lee if I recall), though I'm nearly 100% positive I heard computerized speech well before that. I agree, it's much, much harder to be "wowed" these days. Back then, we were "wowed" all the time (sounds dirty). As I've stated many times, I still have a fondness for synthesized speech.